Are you looking for a tasty healthy snack that will keep your children fueled through school, sports practice and other after school activities? Do you have ‘hangry’ children coming home after school hankering for a filling snack? 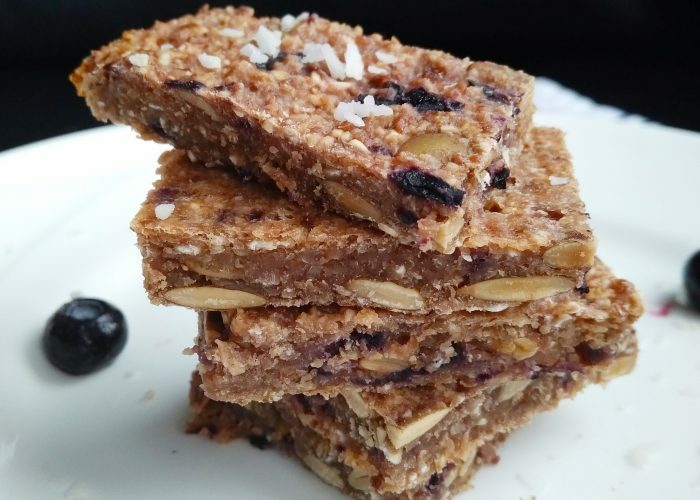 Or perhaps you’re in need of a little ‘pick-me-up’ nutritious energy bar when those snack cravings hit… Well, here’s a recipe for some fabulously easy but deliciously satisfying power snack bars to have on hand for yourself and your family! Try this recipe yourself to see. You may end up eating most of it yourself (I did!) and then making it again but doubling the recipe. These delectable energy snack bars are healthy treats that can also be frozen for all to enjoy at a later date. Simply take a few bars out at a time to thaw quickly and consume whenever the snack craving or need arises! Serve this healthy vegan, egg-free, dairy-free, soy-free, gluten-free filling energy snack bars to hungry little fingers or enjoy yourself as a much needed energy boosting snack on the go! Preheat oven to 400 F or 200 C. Line an 9 inch x 13 inch glass bakeware with a large piece of parchment paper (enough to have a two inch over hang on each of two opposite sides). Soak the raisins in hot water for 5 minutes or until the raisins are plump and soft (make sure the hot water covers the top of the raisins). Then drain the raisins of excess water (I just squeeze a handful at a time gently) before placing them in the food processor bowl. Using the food processor, blend together the raisins, unsweetened applesauce and maple syrup until a smooth texture is obtained. Next, add in the oats and ground flaxseed and pulse again a few times until well combined within the food processor bowl. The oats should be blended down to a finer texture, but the whole mixture does not need to be completely smooth. Add in the frozen (or fresh blueberries) and pulse very briefly 1-2 times to chop up the blueberries into large chunks. Within the food processor bowl (taking out the blades first), add in the measured amount of pumpkin seeds and then use a spoon to combine the pumpkin seeds into the batter mixture. The batter may look slightly wet at this point, but that is fine. Alternatively, transfer the batter mixture into a separate bowl first, before mixing in the roasted pumpkin seeds. Bake the dish uncovered in the oven on the middle rack for 15 – 20 minutes (if you are using fresh blueberries, check the dish at the 15 minute mark, as the bars may be done already) until the surface of the snack bar layer has turned slightly golden and the bar layer looks baked through. Remove the dish from the oven, then take out the flat snack bar layer from the glassware (using the overhang sides of the parchment paper) to lay the snack bar and parchment paper onto a cookie cooling rack. Let the dish cool uncovered for 5-10 minutes before cutting (the snack bar layer will harden as it cools). Cut into snack bars then serve. To roast your own pumpkin seeds, preheat an oven or toaster oven on 350 F or 180 C first. Then spread a layer of raw shelled pumpkin seeds on a baking tray and bake about 8-10 minutes each side, or until the pumpkin seeds turn slightly golden. Remove from the oven and let cool before using. If you don’t need these snack bars to be nut-free, you can also add in ¼ cup of chopped walnuts for extra protein and that additional healthy omega-3 fatty acid boost. Other options include roasted sunflower seeds or chopped pecans. Feel free to cut the snack bars into bigger sizes to be more of a ‘granola bar’ size if desired. For a gluten-free version, use certified gluten-free oats in this recipe. If you want to make these snack bars completely refined sugar-free and don’t mind them being less sweet, omit the maple syrup, honey or agave nectar, and simply use 1 measuring cup’s worth of raisins instead of the 3/4 cup called for in the recipe. Also, if you don’t have a food processor, you can still make this recipe using a blender. Just be prepared to blend the contents a little bit longer (or expect a chunkier texture to the snack bars). Consider making a double batch on the first go, because these winning snack attack energy bars won’t last long in your household! These look so good and the ingredients are all so healthy! Nice share ..
Anna! These look healthy and super yummy! Thank you Marissa for your comment and support!